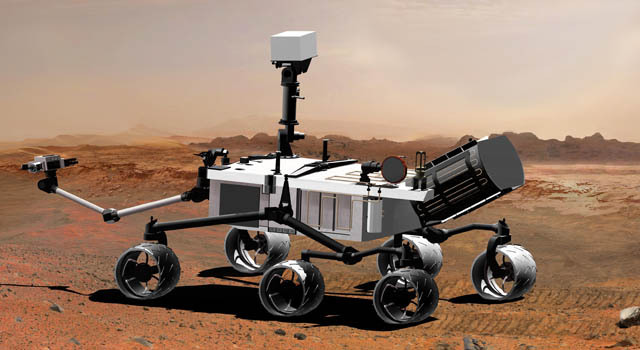 You know, I’m tired of hearing about how the Mars Exploration Rovers are so cute, and spunky, but their successor Mars Science Lab is big and ugly. MSL isn’t supposed to be cute, it’s supposed to be awesome. Just how awesome, you ask? I’ll tell you how awesome. For starters it’s huge: 7 feet tall and almost 2000 pounds. 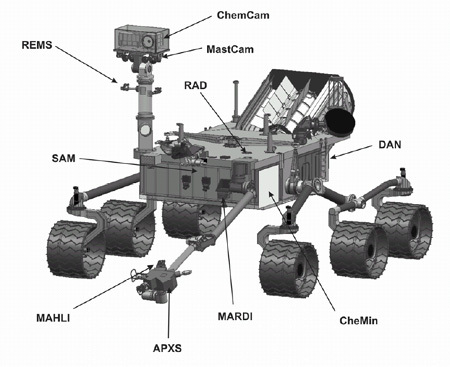 The instrument package on the end of its 8-foot arm is about the same size as the 1997 Mars Pathfinder rover. In fact it’s so big that the famous airbag landing system used by Pathfinder and both MERs just won’t work. There just aren’t airbags strong enough to cushion the impact of such a big rover. And besides, MSL has class. It’s not going to arrive on Mars huddled and asleep, cocooned in wussy airbags. No, MSL is going to arrive in style: on a jetpack. That’s right. After its heatshield (the largest ever flown to another planet) withstands a fiery entry and is discarded, and its parachute (50 feet across and deployed at twice the speed of sound) slows MSL down, our action hero will cut the shrouds and fire up a jetpack. The rockets will fire, bringing MSL within a few meters of the surface. And then, as if all that was not impressive enough, MSL will rappel down from the hovering platform, touch the surface, and cut the cords with explosive bolts. It will then smooth the creases in its tuxedo, adjust its tie and order a martini. Ok, I made up the part about the tuxedo and the martini. But really, its an entrance that would make James Bond jealous. And not only is it a really cool way to land, it is extremely precise, so MSL will be able to access some of the most interesting places on the planet. And just like Bond, MSL has some sweet gadgets. First, there are the cameras. Unlike the MER cameras, these will be true-color, high-definition cameras. In addition to the two mast cameras (one of which is zoomed in enough to make out details just three inches across at 1km away), MSL will have a hand-lens camera, used for studying details of the surface much smaller than a human hair. The hand lens will also be able to focus out to infinity, and could be used to take snapshots of otherwise inaccessible places, like the underside of the rover. (This would have come in handy for Spirit!) There will also be a video camera pointing down to capture MSL‘s heroic skycrane landing. That camera may also work during the mission, recording the changing surface features as MSL roves across the surface. Impressive though the cameras are, the real heart of MSL are its analytical instruments. First of these is the huge organic chemistry lab, SAM, which contains a mass spectrometer to break apart and weigh molecules of martian material, a gas chromatograph to separate the molecules based on their chemical properties, and a tunable laser spectrometer to sense the faintest traces of molecules like methane in the martian atmosphere. Mars has puzzled scientists for a long time because previous missions have been unable to detect any organic molecules, even those that would be expected from comet and asteroid impacts. With SAM, MSL will be able to solve that mystery. That’s nice, but a real action hero needs more. Say, perhaps, x-ray vision? MSL will carry theCheMin instrument, which peers into the detailed structure of crystals by shining x-rays through them. 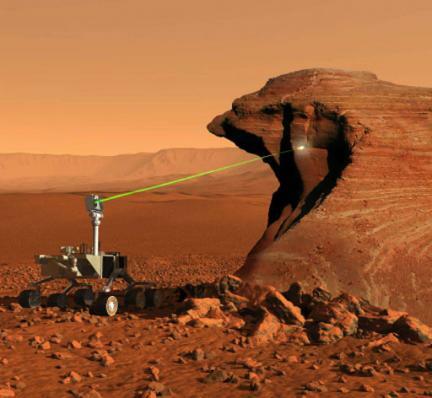 This is extremely important because it will allow MSL to uniquely identify minerals on Mars. All previous missions have been able to measure the elements in rocks and soils, but lacked the x-ray view provided by CheMin which reveals how those elements are put together. MSL does even better than x-ray vision though. It can also see neutrons. In particular, scattered neutrons. The DAN instrument sends pulses of neutrons into the soil, where they scatter off of atoms up to several feet down. Lighter atoms scatter neutrons better, which means that hydrogen (and therefore water) are the brightest things MSL will see with its “neutron vision”. As you might imagine, for a mission in search of evidence of a habitable Mars, being able to estimate the amount of water in the soil will be very valuable. And of course, just because it has x-ray and neutron “vision” doesn’t mean MSL doesn’t want the elemental info too. That’s why it carries two instruments for measuring the atoms in a target. The first is a classic. 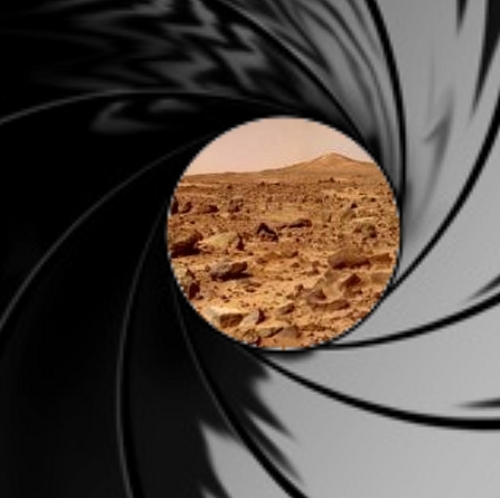 Just like Bond’s signature Walther PPK, every Mars rover comes armed with an Alpha-Particle X-Ray Spectrometer. This instrument bombards the target with alpha particles, causing the individual atoms to give off x-rays revealing their identities. MSL carries a new and improved APXS, capable of estimating the major elements in about 15 minutes. Still, for an action hero 15 minutes is a long time. I’ve never seen James Bond sitting around for 15 minutes waiting for an accurate elemental abundance estimate, have you? No, a true action hero would carry a tool that delivered the info instantly, and preferably involved a laser. That’s why MSL has a laser. No, I’m not making this up. The ChemCam instrument is a high-powered infrared pulse laser, capable of vaporizing bits of rock up to 7 meters away. MSL will use a telescope and spectrometer to collect the light given off by the laser plasma to determine what the target is made of. Even better, ChemCam is sensitive even to light elements like hydrogen and carbon that APXS can’t see. But wait, there’s more! Since it involves a big telescope, ChemCam will also be able to take microscopic images of the targets hit by the laser. Oh, and did I mention that MSL is nuclear powered? No sissy solar panels for this rover! Instead, MSL harnesses the heat given off by a lump of plutonium to get reliable, long-lasting power. MSL laughs in the face of dust storms! Now, don’t get me wrong, I have nothing against the MERs. And they are darn cute. 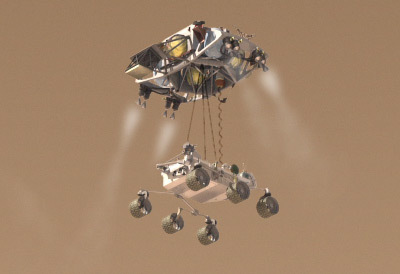 But MSL is a jetpack-flying, laser-toting, plutonium-driven league of its own. It is an action hero, armed to the teeth with gadgets to help it uncover Mars’ secrets and send them back to Earth. One robot will change our view of the Red Planet. Red Rover, Red Rover send the data right over!